News and Events — GCI Ventures Ltd.
March 22，2018，O2 Canada is officially launching its product line in Chinese market in G-Force Innovation Hub, a Hangzhou based China-Canada technology accelerator. Government representatives from both Canada and China, mainstream medias, O2’s strategic partners and distributors are gathering to witness this exciting moment. O2 Canada is aiming to change the world with their unique mask starting in China. Since the masks have been designed based on the massive data gathered from the Chinese profile, it fits comfortably and seals well over Asian face. O2 Canada will also launch new outer-shell covering components designed by famous artists and designers every month. Weldon Car Epp, Consul General of Canada in Shanghai, describes O2 Canada as one of the most creative Canadian startups which will provide Chinese customers with Canadian solutions. He believes there will be more Canadian companies benefiting from the innovation and inclusivity of Hangzhou. Bingxin Chen, the director of Science and Technology bureau of Yuhang District, delivered a warm welcome to O2 Canada’s landing. Along with G-Force Hub, Yuhang District government will do their best to serve and help O2 Canada in China. O2 Canada is a respiratory-performance company specializing in air-purification and optimal-oxygen-uptake technologies for the health, wellness and sports performance markets. In collaboration with the University of Waterloo, the health innovation company has developed one of the finest pollution masks in the world in terms of effectiveness, comfort and style. G-Force Hub leverages our years of experience in the startups investment and acceleration, networks and resources with governments, Institutions Investors, Universities and Research facilities to foster a sustainable technology ecosystem between Canada and China. The first batch of G-Force hubs will be launched in Toronto, Ottawa and Hangzhou. G-Force Hub helps Canadian technology companies to benefit from direct links into the Chinese technology ecosystem of investors, customers and strategic partners. Meanwhile, we will also help Chinese companies with an international vision to expand their business into North American markets. On November 28, 2017, China-Canada G-Force Hub officially launched its first Chinese based hub in the Europe Financial Centre in Yuhang District Hangzhou. This event was hosted by GCI Venturesand Celtic House Venture Partners, and witnessed by Invest Ottawa, Counsel General of Canada in Shanghai, and Hangzhou government officials. Key players in Canadian and Chinese technology sectors, including government officials, venture capitals, corporate and institutional investors, famous local corporates and successful Canada start-ups came together to celebrate this special moment for both G-Force Hub and the China-Canada technology ecosystem. China-Canada G-Force Innovation Hub(Toronto-Ottawa-Hangzhou) will leverage GCI and Celtic House’s years of experience in the startups investment and acceleration, networks with governments, Institution Investors, Universities and Research facilities to foster a sustainable technology ecosystem between Canada and China. The first batch of G-Force hubs is launched in Toronto, Ottawa and Hangzhou. Driven by the success of internet giant Alibaba, Hangzhou has emerged as China’s most entrepreneurial city and be considered as the “Silicon Valley” of China; Ottawa, crowned Canada’s Top Tech Hub in 2017 and headquarter of the ecommerce giant Shopify, is one of Canada’s leading cities for technology and innovation. 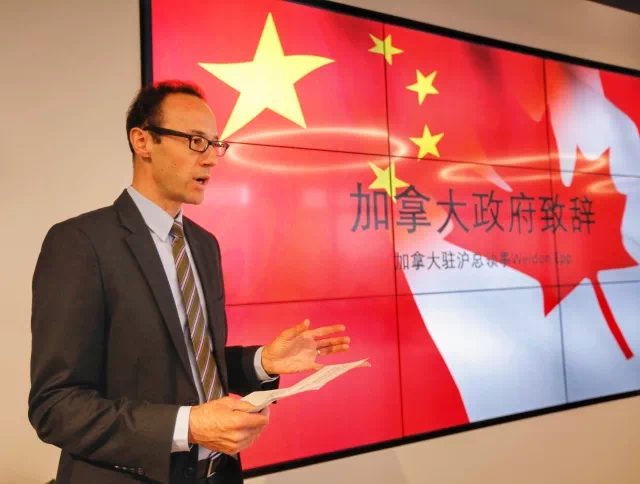 China-Canada G-Force Innovation Hub will help Canadian technology companies to benefit from direct links into the Chinese technology ecosystem of investors, customers and strategic partners. Meanwhile, we will also help Chinese companies with an international vision to expand their business into North American markets. Founded in 2013, GCI is focused on investing in and accelerating Canadian technology companies at various stages by leveraging its business platform and presence in both Canada and China. Celtic House, founded in 1994, is one of Canada’s most successful and active venture capital investors in technology and innovation. Based in Ottawa and Toronto, Celtic House has invested in over 50 technology companies, generating more than 30 successful IPOs and M&As. Invest Ottawa delivers economic development programs and initiatives that increase entrepreneurial momentum, wealth and jobs in the City of Ottawa and its surrounding region. Its goal is to make Ottawa the most innovative City in Canada. Invest Ottawa services include start-up incubation and mentorship, acceleration for existing companies, global business attraction and local business retention, targeted sector development, commercialization, and marketing Ottawa’s diversified economy and high quality of life. TORONTO – November 14, 2017 – Peraso Technologies Inc., a leader in Wireless Gigabit (WiGig®) chipsets, today announced that it has been named a CES 2018 Innovation Awards Honoree for its V125 Reference Design for Wireless Virtual Reality (VR) and Augmented Reality (AR). With the growing industry demand for a wireless solution to accelerate the VR/AR market, Peraso's solution for Wireless VR Applications provides the multi-gigabit throughput and near zero latency needed to deliver a truly immersive virtual experience – all with no wires. Peraso's V125 Wireless VR Reference Design is based on its W120 WiGig USB Phased Array Chipset that is currently in use across a range of consumer electronics and enterprise applications. The chipset incorporates the PRS4001 WiGig USB 3.0 baseband IC, the PRS1141 60 GHz phased array RFIC, and optimized application-specific antennas. As the only vendor focused exclusively on WiGig chipsets, Peraso has centered its research and development on chipset designs that will impact the VR ecosystem through lower price points, longer battery life and smaller headsets. Honoring outstanding design and engineering in cutting edge consumer electronics products, the prestigious CES Innovation Awards are sponsored by the Consumer Technology Association (CTA)™ and judged by a preeminent panel of independent industrial designers, independent engineers and members of the trade media. Peraso’s Wireless VR and other WiGig-based solutions will be displayed at CES 2018, which runs January 9-12, 2018, in Las Vegas, Nevada. Peraso will be located in the Tech East section in Westgate Hospitality Suite 1010. To arrange a private demonstration, please contact: mdenicola@perasotech.com. Peraso is a fabless semiconductor company headquartered in Toronto, Canada. The company is focused on the development of 60 GHz chipsets and solutions compliant with the IEEE 802.11ad specification. The IEEE 802.11ay specification has been adopted for interoperability certification by the WiFi Alliance under the Wi-Fi Certified WiGigTM program. For more information, visit www.perasotech.com. TritonWear (http://www.Tritonwear.com), a Toronto-based sports technology company, announced a game changing project with the Canadian swim team, facilitated by Own The Podium, to achieve significant relay improvements at the 2020 Olympic Summer Games in Tokyo. Catalyzed by Swimming Canada’s commitment to increase the efficiency of their relay takeovers, the collaboration is an ideal match. Dr. Allan Wrigley, IST Director of Swimming Canada, agrees, reinforcing the notion of Swimming Canada being dedicated to improving in Rio. Swimming Canada’s implementation of TritonWear’s technology will begin with variable isolation. Providing coaches with athlete performance insights previously unavailable, the team will be able to isolate and target the exact variables most likely to improve overall performance in its athletes. This project will result in the creation of a new set of valuable everyday training tools designed to deliver on Swimming Canada’s Tokyo 2020 relay goals. Swimming Canada recorded its third best Olympics of all time at the 2016 Rio Summer Games, bringing home six of Canada’s 22 Olympic medals overall. While Canada achieved a bronze in both the 4x100m and 4x200m freestyle relays, the difference between bronze and gold was a mere two seconds in both events. This initiative with TritonWear is designed to help the Canadian relay teams to close this narrow gap. Swimming Canada athletes will begin training with TritonWear in November. About TritonWear: The most accurate swimming wearable technology on the market, delivering performance improvements through data analytics. TritonWear works with clubs, schools and federations around the world, helping athletes achieve new heights. TritonWear captures and transmits a suite of performance metrics in real-time to screens on deck, and tracks trends over time for every outfitted athlete. The combination of personalized feedback and increased accountability for each athlete naturally increases engagement and overall success.